eco-SPRAY® is applied to your air filter every 3000 miles to reduce harmful emissions and increase gas mileage, typically from 8-40%. Simply spray the bottle of eco-Spray® all-natural engine treatment onto the surface of your air filter. Cover the surface of the filter as much as you can and if you have a circular filter spray on the inner portion of the filter as well. Replace the filter in your engine and drive as normal. You will see the benefits of improved gas mileage and reduced emissions shortly. complete gasoline combustion, which results in greater power and less waste. 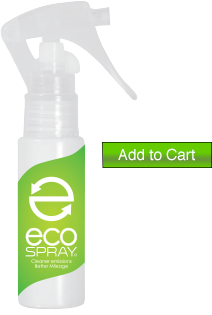 eco-SPRAY® works to improve gas mileage and reduce emissions via two mechanisms. It deep cleans carbon deposits from the engine, similar to fuel additives, but it also changes the fundamental chemistry of the combustion process. 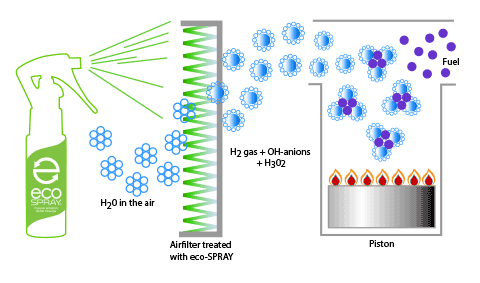 eco-SPRAY® produces infrared light energy and anions (negatively charged ions). When eco-SPRAY® is applied to the air filter of your car, the infrared light works to fragment chemical bonds. The humidity (H2O) in the air entering the engine through your air filter is electrolyzed and is subdivided into OH radical (OH–) and hydrogen ions ((H+). When exposed to infrared light, water molecules try to become (2H2O) however these molecular bonds cannot be formed. Thus, H2O molecules are subdivided into Hydroxyl ions (H3O2– ) and Hydrogen ions (H+)). The remaining (H+) and (H+) atoms bond to become Hydrogen gas (H2). The Hydrogen gas can act as a fuel, and the OH– radicals increase combustion power. When hydroxyl ions are emulsified, they are more easily oxidized, which in turn increases power. Extra anions stick to the inner wall of the piston chamber and neutralize static electricity (cations), produced by piston friction. This allows combustion with a more unified molecular density, by reducing the amount of both fuel and air molecules which are drawn to the inner wall of the piston chamber by this static electricity. Improved combustion efficiency means improved gas mileage. Reducing static electricity also benefits engine performance by making it run more smoothly, quietly, and by decreasing engine oil temperatures. Traditionally, 95% combustion is considered high. eco-SPRAY® allows combustion efficiency to be increased to the 95-100% range, which acts to reduce pollution, improve power, and increase gas mileage.